Bascomb James (ed. ), Far Orbit: Speculative Space Adventures. World Weaver Press, 2014. Pp. 280. ISBN: 978-0-6159-5924-5. $13.19. The anthology, edited by Bascomb James and published by World Weaver Press in April 2014, is a well-crafted collection of thirteen stories, each with elements from Grand Tradition—science fiction usually associated with the 1940s-1960s, optimism, wonder, adventure and respect for science. Space and space adventure is the dominant frame of this book, but it has a broad range of themes and plots. In addition to asteroid hunting and crashing space ships, the characters in this book deal with issues like alien bunnies, walking plants, a spaceship landing behind your trailer when your ex-wife stands at your front door, war-traumatized alien babysitters who associate microwave sound with sonic weapons, space pirates at Saturn, a poker game with high stakes and something old awakening in the alien graveyard at Necropolis. These tales are grand, terrifying, dark, beautiful, disturbing and funny. I recommend the book for lovers of science fiction set in the far orbit and for all who want to read fiction filled with enthusiasm, adventure and exploring of new worlds. Several of the stories herein are excellent, amongst them Peter Wood’s ‘Spaceman Barbecue’. Wood manages to capture the atmosphere of science fiction written in the 1940s and 1950s. He writes the story about Hank, divorced and miserable, who one day to his surprise has a silver spaceship landing in the woods behind his trailer. The pilot in the sparkling gold space suit, Matt, finds himself stranded in a foreign world and moves in with Hank, while he awaits his rescue. Wood writes compelling about the collision between the two men’s worlds and how their meeting change them both. I liked this piece. Another great story in my opinion is ‘The Cringle/Racket Incident’ by Jacob Druid. The story is told through a correspondence between a childcare company and a government employee (and mother) looking for a babysitter. The story is short, but the creepy details revealed in the e-mails creates a disturbing world that grows in strength throughout the pages. A very clever plot. This was a fun read. Several of the action-driven stories in the anthology have a woman as the main character. In the story ‘Obsidianite’ by Kat Otis, Janessa replaces her pilots like other people change their socks. She travels between the stars searching for objects she can trade and make a profit on, even if it means landing beside an erupting volcano and having to face her unscrupulous ex-husband. She’s a woman who thinks on her feet and follows her instincts. A thrilling and refreshing read. The story ‘A Game of Hold’Em’ by Wendy Sparrow plays with the classic Wild West narrative, the harsh landscape and a hero who plays to win no matter the stakes. Sparrow tells about Moses, Texan born and raised, who does business for his company on the planet Baru, and has to play a poker game against the corrupt and criminal Martice, who is law on Baru. To get contracts for his company on Baru, it would be wise to let Martice win the poker game, but when Moses arrives at the game and sees who’s dealing the cards, the game evolves in unexpected directions. This was a good read. I feel that most of the stories in this anthology are strong and it is difficult to pick out examples as outstanding. The stories I have not mentioned here are all good reads. Several of the stories are reprints; many are written by awarded and well-established authors, but you’ll also find stories by newly emerging authors. 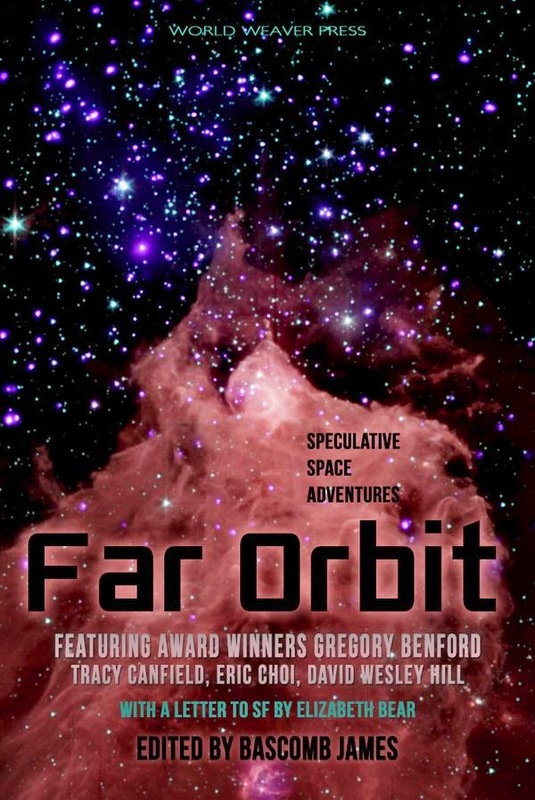 World Weaver Press and Bascomb James have done a good job with Far Orbit, and picked out stories that each represent a subgenre and narrative within Grand Tradition science fiction. There is the noir, the 1940s pulp, the spaceship voyages, the realistic hard science fiction, the quest story, the pirate story, the first contact, to name a few. Many of the main characters are scientists and researchers, adventurers and explorers. Many are on the wrong side of the law, and many are looking for profit. The stories give the readers almost a vintage feeling. They don’t shy away from discussing social, political and ethical questions, but it’s not the main motif of the stories. This is pure entertainment and very refreshing to read. What I loved most was the optimistic voice throughout the book. This is one of the reasons why I always have loved science fiction from the 1940s and 1950s, and I feel the anthology manages to grasp this mode. There is both an innocence between the lines—a wonder for the unknown, and a boldness—a fearlessness in face of the unknown. Well done. All in all, I found this collection worth while reading, well written and entertaining. I think everyone who is fan of science fiction will find a story based on own preferences here.